This has been going around and I've been hoping to get tagged for it (and if I have but didn't see it, my apologies!) Anyway, Red Cardigan tagged anyone who wanted to play, and that's good enough for me! Those tagged will share 5 things they "love" about Jesus/ Or why they love Jesus. 1. 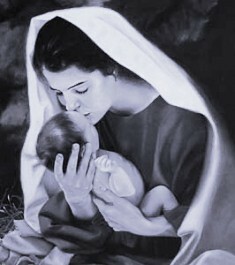 I love how Jesus related to infancy. He decided to come into the world as a small little baby via pregnancy, and he liked to be around little children. If we are to be more Christlike, shouldn't a love of babies and children be a big part of that? I think it is. I should also mention that there are many pictures of Baby Jesus and young Jesus around my home. I guess that is one of my favorite ways to think of him, as soft and gentle. 2. As the mother of four sons one of the things I love about Jesus is that he was a mama's boy! He stayed home to 30 and then wherever he went, whatever he did, His mom was always there for the highlights and the tragedies. 3. He was a great debater. When I was a daydreaming kid, or a lost-in-thought teenager, I always perked up for the Gospel reading if it had something to do with the Pharisees trying to trap Jesus. I loved how he was always won the debate, with style, grace and logic. 4. He looked evil in the eye and prevailed. 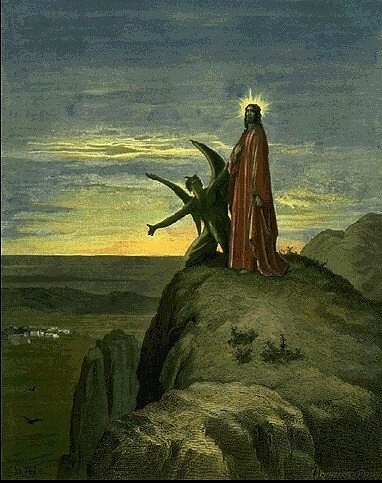 Whether it was a Legion of devils in the possessed or with Satan himself, Jesus never flinched. 5. Jesus was the master storyteller. Parables with a purpose that taught the very young to the older and wiser, with many levels of understanding so that all could learn. Please feel free to post your responses if you wish in the comment section or link to your own blog. I would like to tag Candy Brauer though. She spends a lot of time blogging about being a Christian by avoiding anything that smacks of Romanism, but I rarely read anything on her blog about Jesus, so I'm curious. 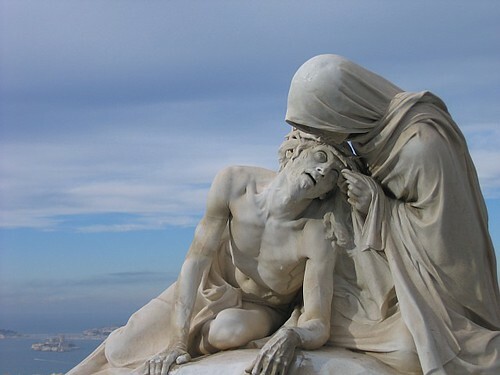 Mary and Jesus photo from Pictoral Musings. I've not heard of the lady's blog you mention but now I want to read her stuff 1 I write all the time about being a catholic & Him etc. and I do not like roman culture much at all, pagan or catholic that is why I'm so happy we are not officially the roman catholic church just the catholic church but here in canada we are also learning as our arch bishop just spoke at our church about removing european culture from our catholic religion in parts of the world people are not european . we attend an aboriginal catholic parish which I love but because we are not fully aboriginal I also do like the celtic catholic christian church culture too and even some european catholic culture such as spanish , latin american too. Oh my I had no idea that lady is a catholic hater ! I just wrote on my blog dedicated to healing from abuse how does one respond to the issue of haste and judgment . I've been encountering just nasty anti catholic stuff from my sil and her friends who are pagan . they are so hate filled in thier haearts . they claim to be so very non judging and that all christians are yet they actually have hate for catholics just because . I am never to respond to hate with hate . the gospel for the day I had journaled my dilema was the gospel of his arriving in Jeruselem and everything all his persecution , His acknowledging He was being victimized yet He chose not to remain a victim . He said forgive them for they know not what they do. People sin and have hate out of fear and ignornace . look at that woman you have written about and her response to catholic mass . Does she not know that we need not carry a huge bible with us to church because we read from the bible during mass ? plus has she not heard of a missal ? obviously she was more wrapped up in her own self to take note of what really was going on . anyway I can garuntee you if you pray for that lady God will ease your heart about her & her blog . she must have a reason hidden inside as to why she is so full of fear ? I will say a pray for her maybe she will expereince some type of conversion ! Thanks for coming by Rox and have a blessed Easter!